It's no secret that I am terrible at doing my own nails. The problem is, I'm impatient. I hate waiting for them to dry before I can do anything. If I paint my nails, as soon as I'm done, I'll want to eat or text or do something that involves messing up them up. Anything that promises to speed up the drying process is a winner in my books. 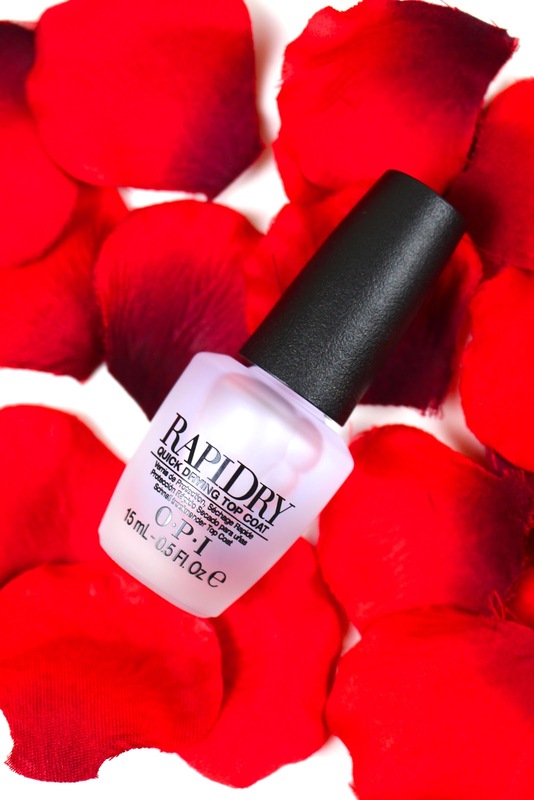 The OPI RapiDry Top Coat does exactly what is says on the bottle. It dries fast. By the time I've finished applying it to one hand, it's dry. The formula is not too shabby either. It helps my polish last well with there being no chips for about 3-4 days. It's not as glossy as the Bourjois One Second Top Coat, but it has a very similar wide brush. You're able to evenly coat the nail in one swoop. At £14.50, it is expensive but I definitely think it's worth it. It's a good simple fast drying top coat. I love it! What's your favourite fast drying top coat?